On 29 October, participate in a Symposium on the future of the Web and a gala dinner at the occasion of W3C's 20th anniversary. 3 Oct - Discount hotel guestroom rate expires 5:00 pm pacific time. How was your TPAC week? Tell us via the TPAC survey by 16 November 2014. Advance Registration is Closed. Read who has registered and more on registration and payments below. Looking to share a ride? Check out the Taxi Wiki. TPAC 2014: the Combined Technical Plenary / Advisory Committee Meetings Week brings together W3C Technical Groups, the Advisory Board, the TAG and the Advisory Committee for an exciting week of coordinated work. This year, Wednesday, 29 October will consist of a morning and afternoon of breakout sessions, followed by W3C 20, an 800-person event and gala dinner open to TPAC participants and the general public. The following participation policies and recommendations are intended to promote participation while ensuring that meeting Chairs have the tools necessary to run their meetings effectively. Before you register to attend a meeting, please read the below participation guidelines. You must be a participant in a W3C Working or Interest Group scheduled to meet at TPAC, the Advisory Committee Representative of a W3C Member organization, a member of the Advisory Board, the TAG, Offices staff or Team or an Invited Guest in order to be eligible to register for and attend these meetings. Anyone eligible as described above may request to attend other group meetings as an Observer. People can make such requests via the registration form. The group Chair will inform you if you may attend as an observer. Chairs have wide latitude to grant or reject requests based on space considerations, confidentiality, and the ability to conduct the business of the group. Please contact the WG or IG Chair for information about the participation policy (see Member-only Chair contact information). Observer seating will be organized for meetings that permit observers as "secondary seating without power" around the perimeter of the room. Observer seating will be limited. Note: We advise folks to secure permission to attend a meeting as an Observer before making any travel plans. Participants in good standing in a W3C Working or Interest Group, Advisory Committee Representatives, the TAG, the Advisory Board, Offices Staff and Team are invited to participate in the Plenary Day. 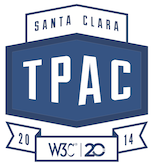 Registered TPAC Plenary Day participants are invited to the W3C 20th Anniversary Symposium. Please use the TPAC registration form to get the TPAC rate. Mid-June we plan to open W3C20 registration to the general public for a limited number of seats. Participation in the Tuesday and Thursday portions of the Advisory Committee Meeting is open to one Advisory Committee representative from each Member organization. If an Advisory Committee Representative cannot attend the meeting, an alternative may be sent instead. See section 2.1.3.2 of the Process Document for more information about Member participation. The Advisory Board, the TAG, Chairs, Offices staff and Team members are also encouraged to attend the AC discussion sessions. For the Advisory Committee dinner, participation is limited to one AC Representative per organization, Group Chairs, Advisory Board, TAG, Offices staff and Team. in response to requests from some groups for sanctioned time to break into parallel task forces within their groups, for more cross-group interaction opportunities, and for hallway conversations. We thus encourage groups to use the 11:00-15:00 time slot (which includes lunch) for unstructured time, in particular on Tuesday and Thursday. This will reduce (even if it does not eliminate) overlap with the AC meeting. Groups may still use this time slot for their traditional meeting agenda. Please see the ad-hoc meeting wiki for more information about unstructured time, and to help coordinate shedules. To ensure a comfortable lunch experience, we will work with group Chairs (via a survey) to stagger lunch schedules. Working and Interest Groups may request telephone access for remote participants. We do not yet have information on other W3C-provided remote participation options during TPAC 2014. If we have a positive experience at AC 2014, we would anticipate providing some remote participation services during TPAC 2014. Groups may also arrange their own solutions; please inform us so that we can accommodate bandwidth demands. We will reach out to group chairs in September to learn more about remote participation needs. If you plan to attend the Advisory Committee Meeting remotely, please let us know on acregister@w3.org as the number of requests may play a role in the level of service we provide. We are planning to webcast the W3C20 Symposium. IRC is available for all meetings. See our Guide on using IRC at W3C meetings. A daily fee helps W3C offset the cost of these meetings. The daily fee applies to anyone who is attending meetings, whether as a participant or as an observer, Monday through Friday. However, if you are an AC Rep and on Tuesday, you plan to attend only the dinner (not the afternoon session), you do not need to pay the fee for Tuesday. The registration fee for Wednesday, 29 October includes attendance at the Technical Plenary, W3C20 Symposium, and Gala Dinner. *Important Notice: We strongly advise against people making flight arrangements before confirming their meeting registration and payment by 8 October. Each year, we make an effort to accommodate on-site registrants, however, we cannot guarantee that space will be available this year. Please pay when you register. Registrations that remain unpaid after advance registration closes 8 October will be charged 150 USD per day. Registration is not complete until you have paid. Payments will be processed through a payment system (requires W3C member account). Use this payment system link if you do not have a W3C member account. You will receive a receipt if payment was successful. If you experience problems with the registration page, please contact w3t-tpregister@w3.org. Cancellations and requests for refunds must be received by 17:00 ET on 1 October 2014. Refund requests will not be honored after that time. Refunds will be subject to a 20 USD service charge. To cancel your registration and request a refund, contact w3t-tpregister@w3.org. Group Meetings will be held all day Monday and Tuesday, 27-28 October, and all day Thursday and Friday, 30-31 October. The Technical Plenary day will be held Wednesday 29 October from 8:30 - 14:45. Meeting Room Availability: Meeting rooms will be available from 08:00 - 18:00 Monday through Friday. Lunch: To ensure a comfortable lunch experience, we will work with group Chairs (via a survey) to stagger lunch schedules. Guest Room Rate: 229 USD plus applicable taxes (currently 9.6% plus 1.00USD TID tax). Breakfast is not included in the price of the room. W3C Reservation Link. The group rate will be available from 24 October - 1 November. If you arrive earlier or stay later, the group reservation link will not work. We suggest making a separate reservation through the main hotel reservation link. 23 September 2014 Marriott Update: The W3C block at Santa Clara Marriott is full on Tuesday, Wednesday, and Thursday nights: 27-29 October. There are rooms available outside W3C's block at a higher rate; 324-349 USD plus taxes. W3C block: Rooms are still available on Saturday, Sunday, Monday, and Friday nights: 25-27 October and 31 October at the TPAC meeting rate of 229 USD plus taxes through 3 October. Wifi: The standard high speed guestroom wifi fee has been waived for W3C TPAC2014 meeting participants. Guestroom discount expires: 3 October 2014 17:00 pacific time. After 3 October, reservations will be accepted on a space-available basis only, at current market rates. Cancellation Policy: You must cancel your room by 18:00 day of arrival, or your credit card will be charged one night's room and tax. Please do your best to stay at the Meeting Hotel. We have done our best to offer a competitive guest room rate. In order to meet guest room quotas, avoid steep charges for meeting rooms, and maintain all the meeting space we require for a successful meeting, we kindly ask that you book your room at the Santa Clara Marriott. Mineta San Jose International Airport is the closest International airport to the meeting site. The Santa Clara Marriott is located just 4 miles from the San Jose International Airport and 30 miles south of the San Francisco International Airport. The travel time between the airport and the hotel (meeting site) will vary between 20-45 minutes depending on traffic conditions. Taxis are plentiful and fares vary. The Hotel Fact Sheet provides driving directions from the San Jose, San Francisco, and Oakland airports. Wifi at Meetings: Wireless Internet access will be available in meeting rooms during the week. Power: 110 V, 60Hz, US standard outlets. There will be no power at Observer seats. Weather: You may refer to wunderground.com for Santa Clara, CA weather..